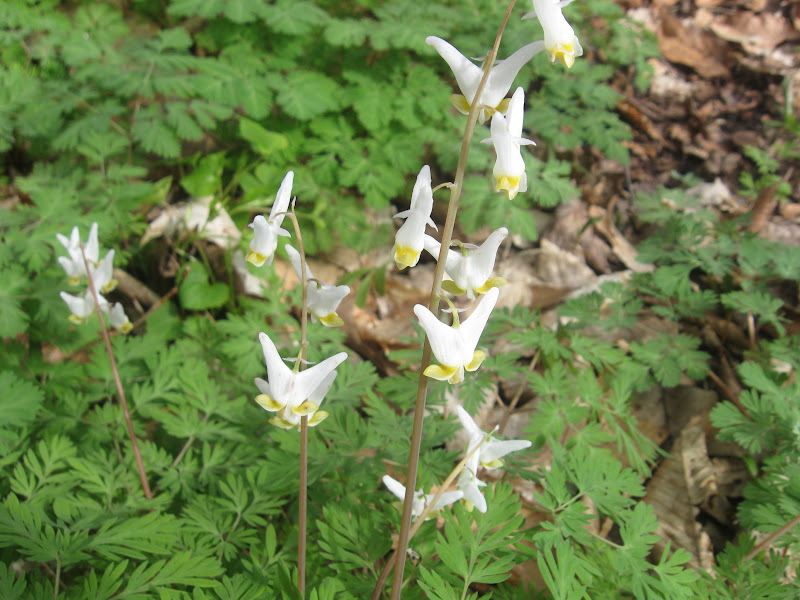 *Note: If anyone can add, confirm, or correct the identification of any of these plants or animals, please do so. Thanks! For my May 2011 trip, click here. 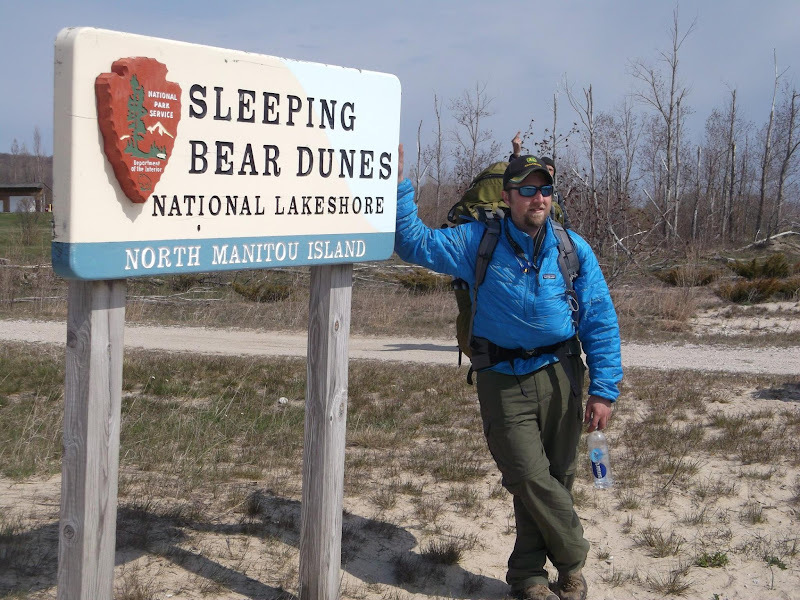 I was originally scheduled to return to Manitou Island on May 9, but the winter has been so long and cold that the harbor at Leland was still frozen, so my trip was rescheduled for May 16. 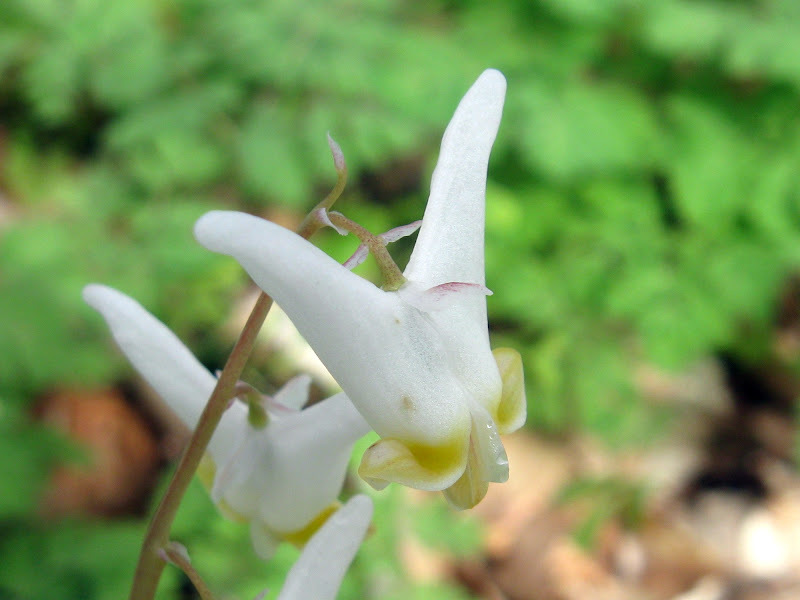 My primary objective of this trip will be to find the elusive Angell Spring, which I’ve sought many times without success; secondarily to view the upcoming meteor storm from the top of Old Baldy; and more generally, to map out some old hidden roads, test new gear, and just enjoy nature. Despite my best laid plans, and even the rescheduling of the boat, I still find myself doing my typical last minute packing. It’s after 3AM, and I’m almost out of coffee. Just six hours until check in. Just pack Cadillac, it started to snow. I’ve finally made Leland, too late for breakfast at the Early Bird, but with enough time to grab a sandwich for this afternoon. 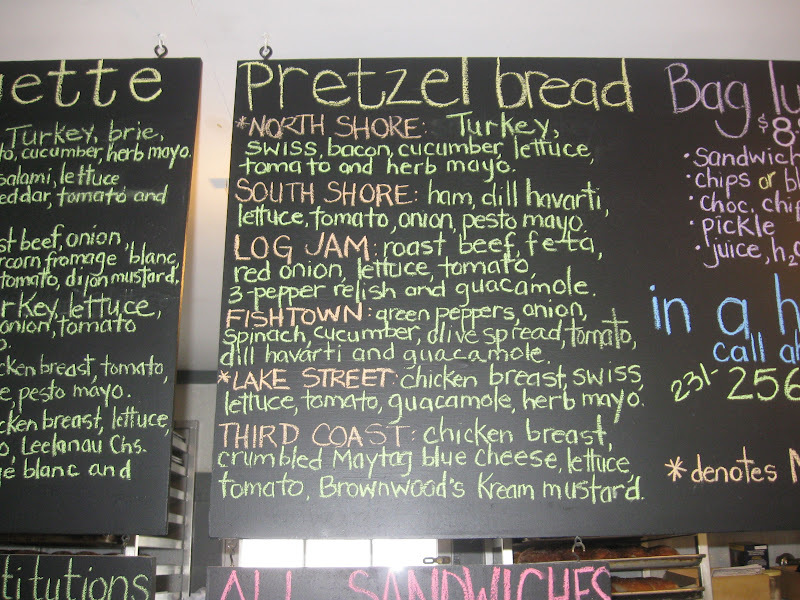 My favorite is the North Shore on pretzel bread. 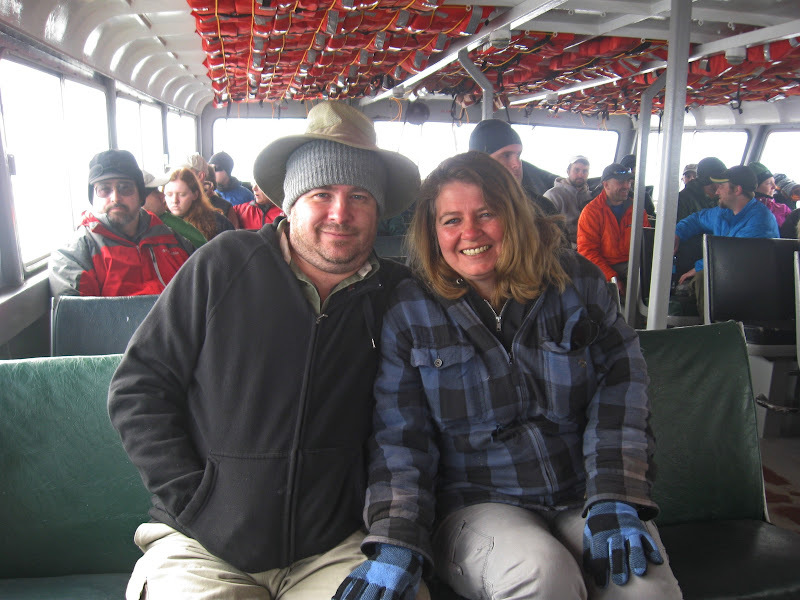 On the boat, I meet up with my friends Keith and Cindy. 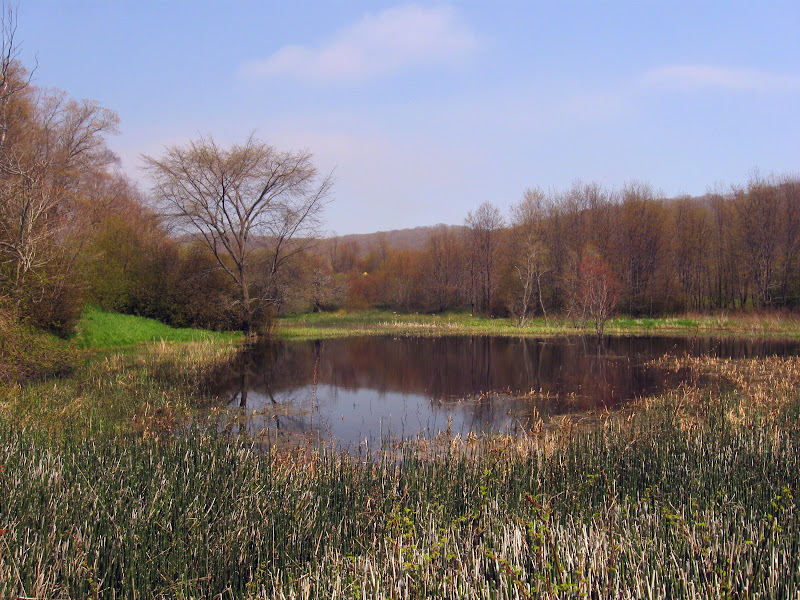 We talk about the various springs on the island, and my quest for Angell Spring. They’ll be staying on the island for a week, so I’ll probably meet up with them next week. 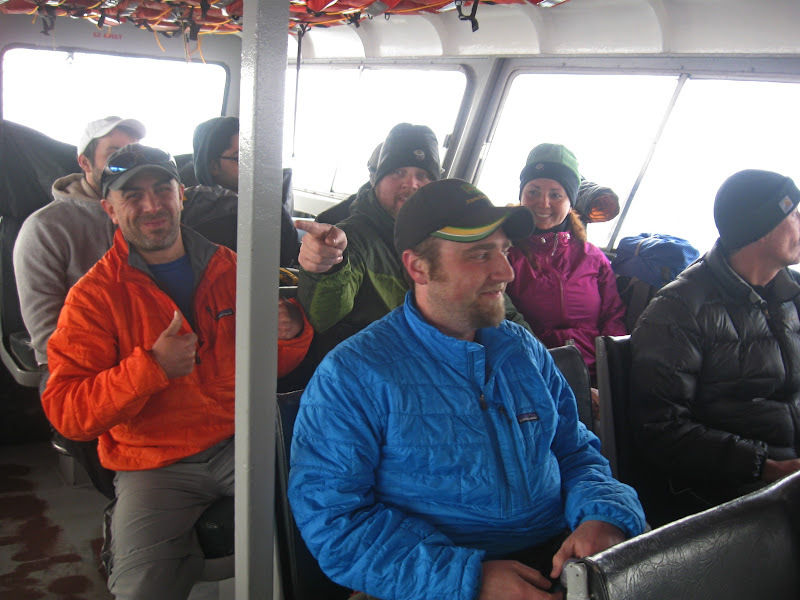 Also on the boat are my friends Rich, Marcus and Jackie, Jeremy, and Paul. They’ll only be staying a couple nights, so I’ll “hang” with them first. Recently, the Mishe-Mokwa was upgraded with a new engine, making for a slightly quicker ride. At 11:06, the boat finally arrived at the dock, and at 11:14, we had our boots on the sand. It feels great to finally be back on the island. There’s no ranger on the island, so we get to skip the orientation. 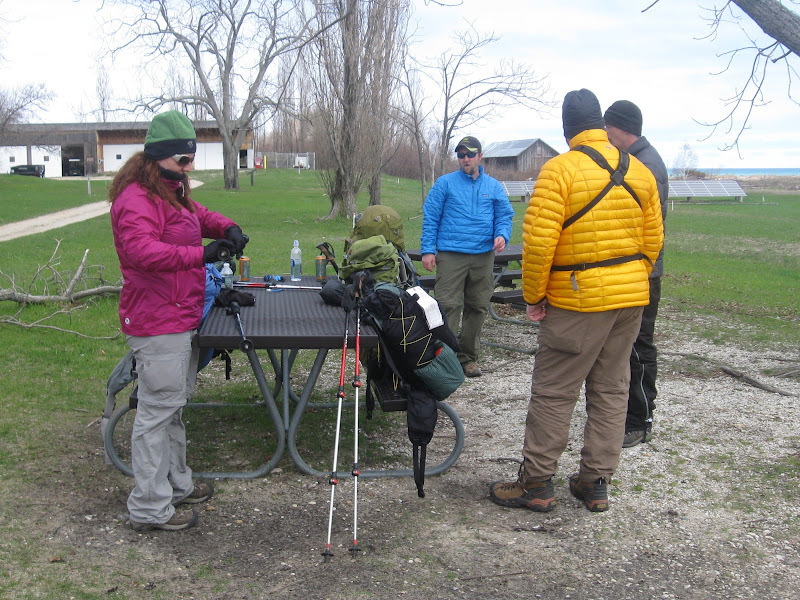 Before we hit the trail, we have time for lunch and a cold beer, and to avail ourselves of the last civilized facilities. Our first destination is Tamarack Lake, but our breaks are frequent. My pack makes a great backrest. The island is quite different than I’ve ever seen it before. The trees are bare, and the trail is wide. 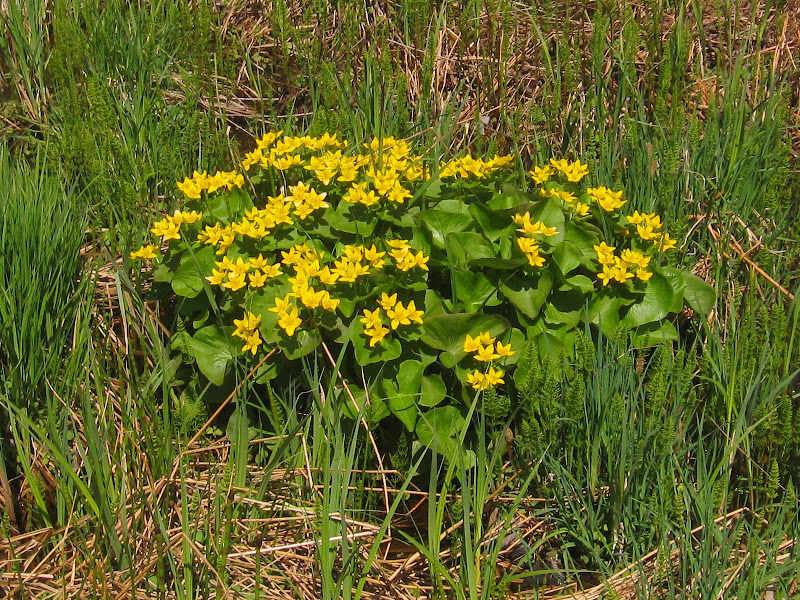 Without the leaves and undergrowth, you can see things normally hidden. The island seems much smaller. After a few breaks, we come to the road leading south through Swenson’s field, towards the stream that feeds Tamarack Lake. The road here is good until we come to where it branches, and crosses the stream. From there, it’s more difficult to follow, but eventually we reach Tamarack Lake. Though our packs seem to be getting heavier, we decide to push on for the promise of many nice hanging trees at Johnson’s Place. We retrace our steps back to the stream crossing, and then turn south. 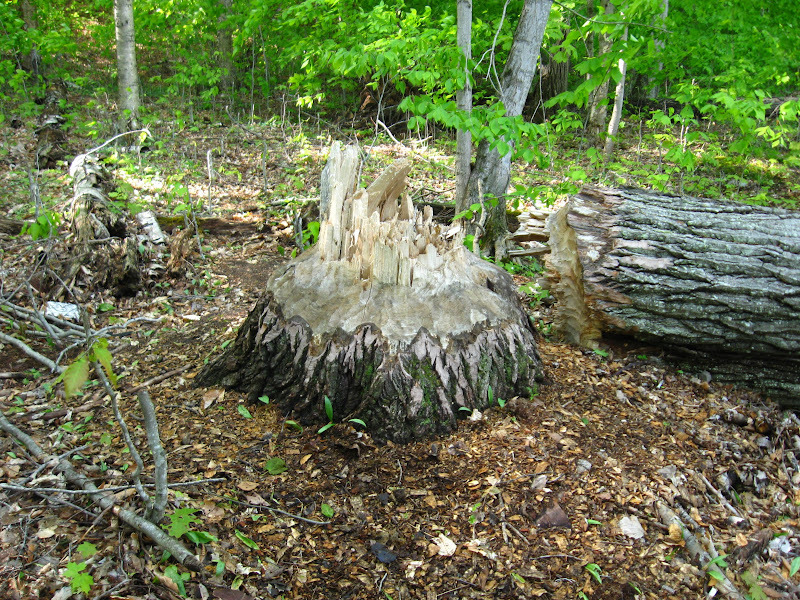 There are a couple beaver dams along the way, and this HUGE tree some crazy beaver chewed down! 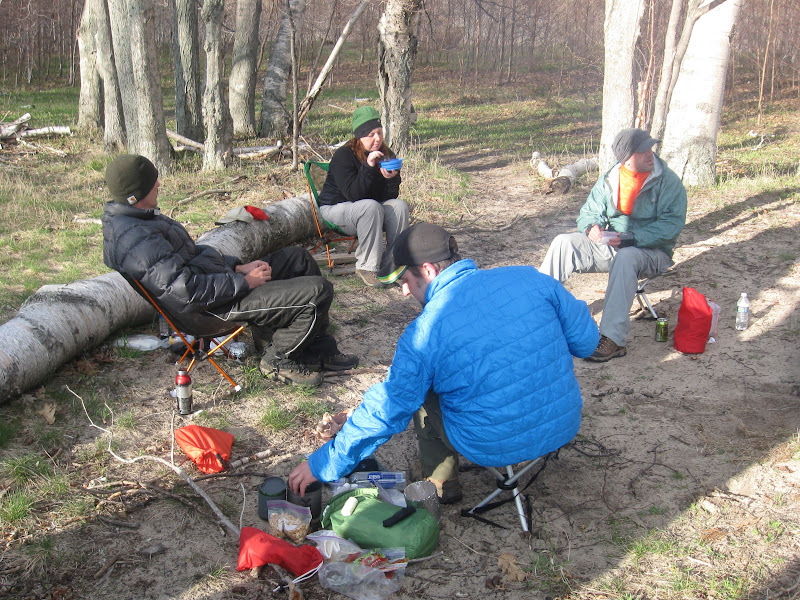 Finally at Johnson’s Place, everyone finds a couple trees, sets up camp, and has dinner. Our friendly neighborhood deer pays us a visit. As the sun starts to set, it gets chilly. 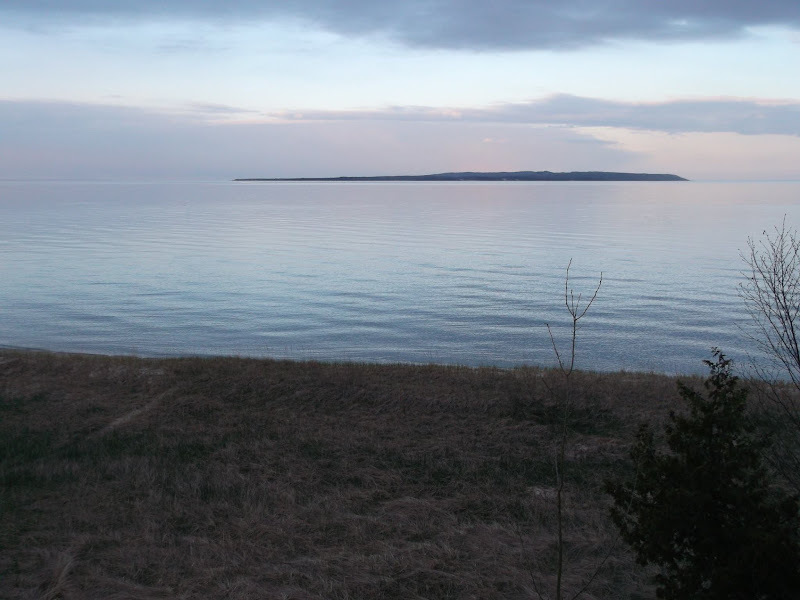 Johnson’s Place gives a great view of South Manitou Island in the distance. It got down to 28 degrees last night, but today is looking beautiful! This is a pleasant surprise, because the forecast called for mostly cloudy skies, with a high only in the 40s. We pack up, and head south to Fredrickson’s. 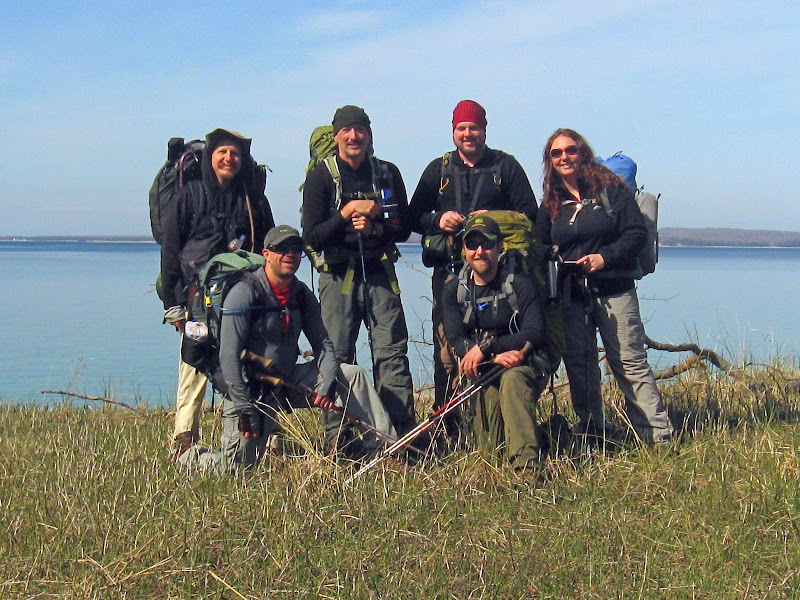 Fredrickson’s is a nice little clearing, and a great spot for a group photo with South Manitou Island in the background. After a brief stop at Fat Annie’s, we continue on to the cemetery for lunch. After lunch, we make our way to the beach to find our next campsite. 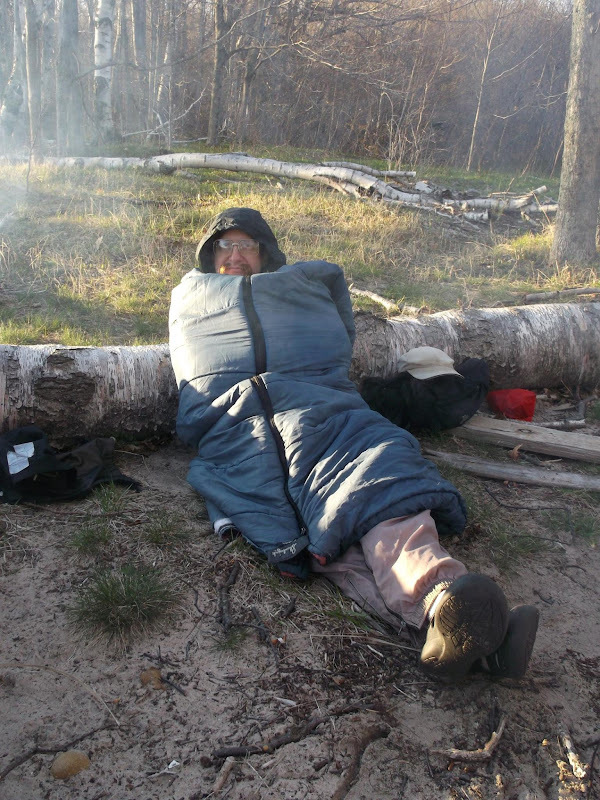 Once camp was set up, everyone was ready for a nap. 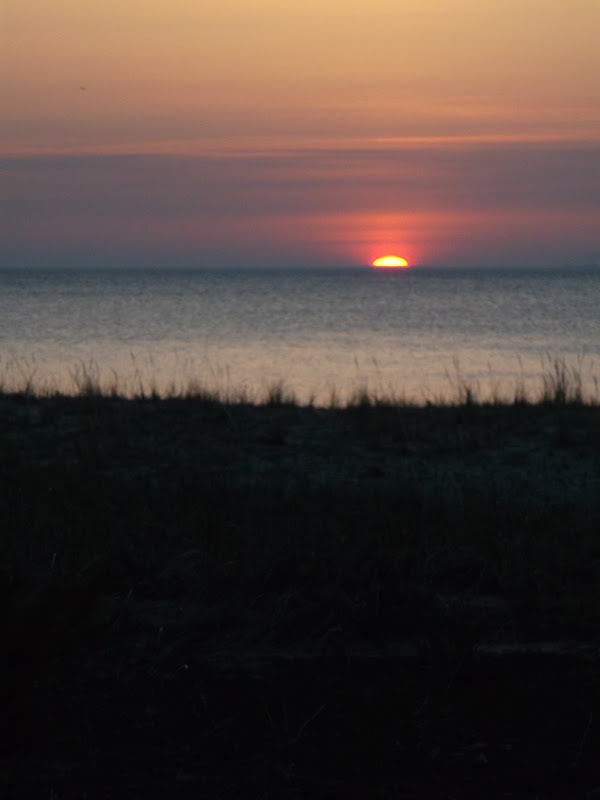 Morning comes early on the east side of the island, but Rich was up early enough to watch the sun rise over Lake Michigan. Everyone else is packing up except me. I’ll accompany them to the dock, but I’m coming back here afterwards. Some take the beach, but I choose the trail. The trees are mostly still bare. 11:07, and everyone’s aboard the boat and ready to head home. 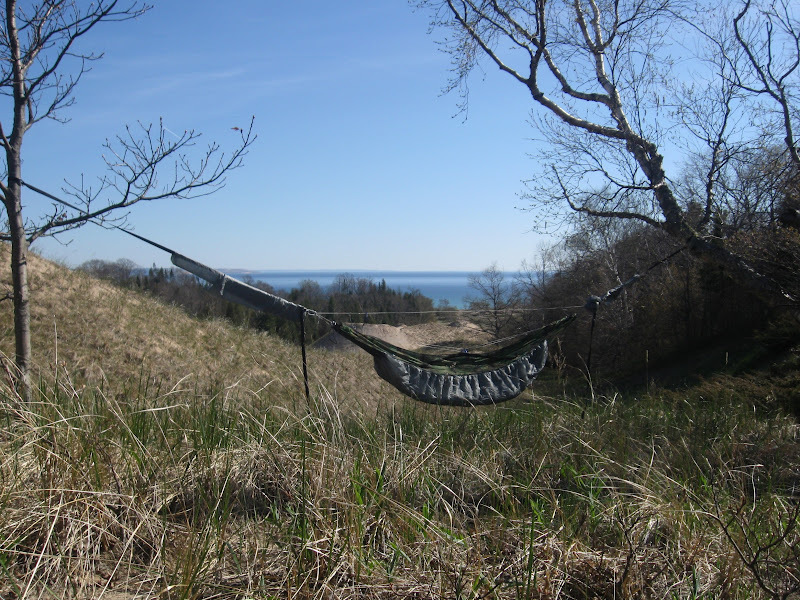 As for me, I hear my hammock calling my name back at the campsite, but I’ve got all day to get there. Along the way back, I map out some of the roads and paths that cross between the two main trails going south, and pause to take in the scenery. Finally back at camp, I fall into my hammock and enjoy the tranquility, swaying in the gentle breeze, and forming my plan for tomorrow. I want to search for Angell Spring. I’ll camp close to there tonight, and then have all day tomorrow to search for it. After a nap, I pack up camp and bushwhack west to the main trail, then make my way to where Angell Spring is supposed to be. 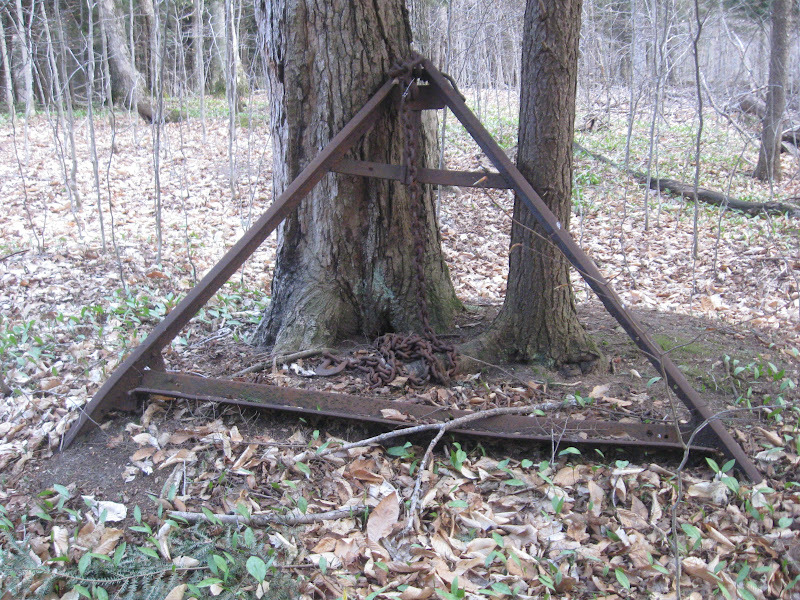 Along the way is this old A frame, which I always liked to think meant I was close to Angell Spring, but I could never find it. I’ll set up camp under the evergreens across the road, and call it a night. I’m almost out of water. So far, I’m still drinking what I brought from home. Yes, I can carry three days worth of water in my pack, but now I’m running low and have just enough left for breakfast. After that, I’ll have to go down to the cemetery spring to get some more. The “cemetery spring” is my name for the spring closest to the cemetery. It’s right off the main trail, making it the easiest one to get to. I discover another road today, going right from the road I’m camped on to the cemetery spring. Part of it is cut into the side of the hill, and beneath it is a nice camping spot, on the south side of the hill. The spring is flowing well, and I fill up my three liter reservoir, plus drink a couple more cups while I wait. It’s early afternoon now, and I’m back at camp, setting out my solar panels to charge my batteries. 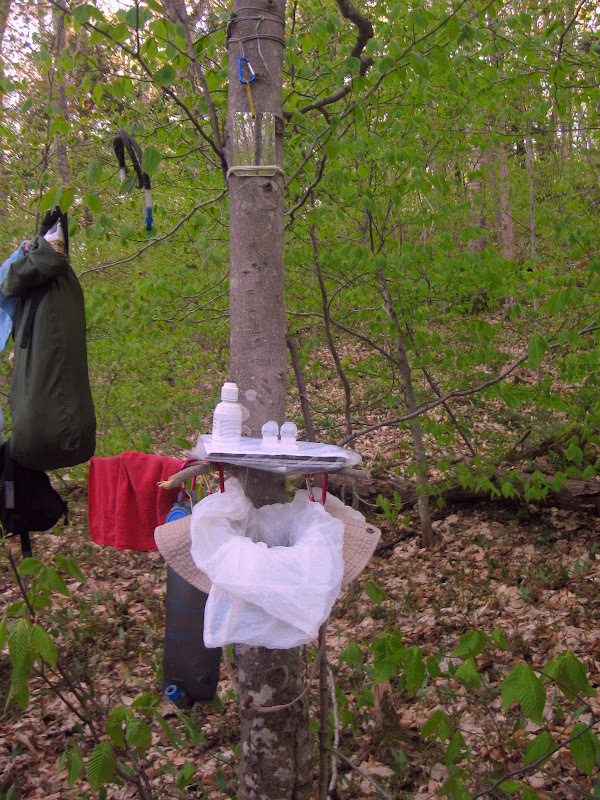 And I just realized that I left my long prusik on the tree down by the spring! Well, it’s not essential, and not worth the trip back down there and back right now, so maybe I’ll go back for it later. Being early in the year, there are few leaves on the trees, so even here in the deep woods, I get plenty of sunlight for my solar panels. And, maybe also because of the lack of leaves, I seem to have surprisingly good cellular service! Now that I’m filled up with water, I start my search for Angell Spring. I’m first heading to the exact spot where it is supposed to be according to the USGS topographical map, and then I’ll start making circles, spiraling outward. 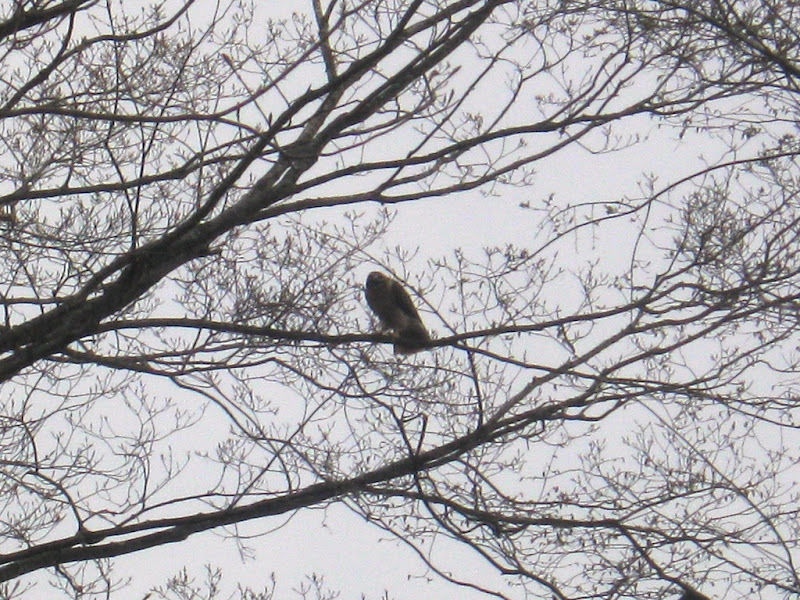 This red tailed hawk really doesn’t like me stomping around the tree where its nest is. It’s called in for reinforcements several times. 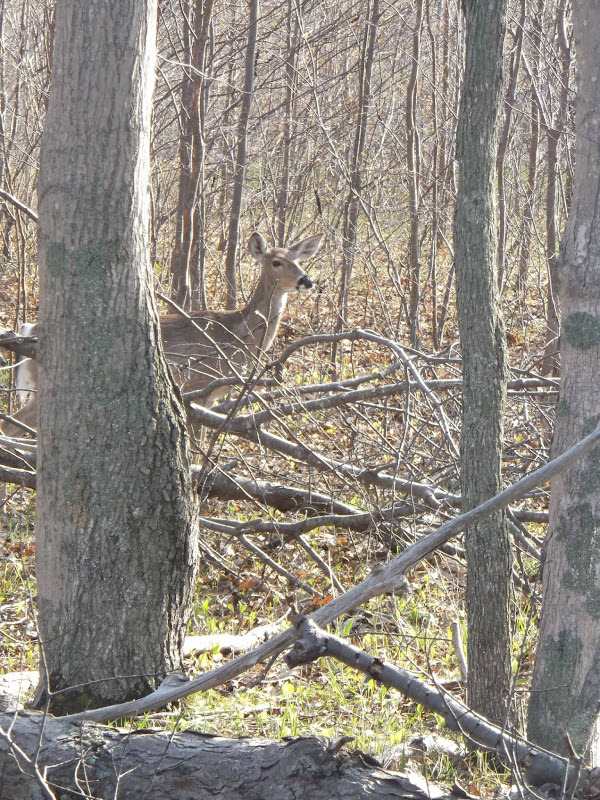 They circled around and screamed at me, but kept their distance. This has been going on for a couple hours now. Search as I might, I still can’t find that dang spring! Either it’s dried up, or its location is very wrong on the map. Enough for today. I’ve covered about fifty acres, and it’s not here. I’m heading back to camp. Despite another failed attempt, it’s actually been quite enjoyable to spend the whole day just wandering around in the woods. Some may think the woods are just a bunch of trees, but each area seems to have its own personality, and the more I explore, the more I feel one with the island. I still have enough daylight left to make a quick trip down to the other spring to retrieve my prusik. On the way, I find yet another road. After returning from the spring, I explore this old road for quite a ways, but I need to leave myself enough time to get back to camp before dark. This old road starts south of where I had been searching all day, heads west up a ravine, which curves around to the north. It will be very difficult to follow later in the year when everything’s grown up. If I don’t finish exploring it this trip, I’ll have to follow up on it next spring. It started raining very early this morning, maybe even around midnight, and it still continues. It was quite the thunderstorm at times. I’m glad I seam sealed my tarp. As far as I can tell, there hasn’t been a single drip. The rain stops and starts throughout the morning, but is over by mid day. Having failed my quest yesterday, despite the valiant effort, I’m going to pack up and hike to the other side of the island today and try to find Keith and Cindy. They said they’d be camping somewhere by Crescent City. By early evening, I’ve made it across the island and found their camp. I’m eating like a king, a hot dinner, multiple desserts, and rum! Thanks guys!!! And to top it all, they found Angell Spring! Its location is wrong on the map, maybe a third of a mile north of where it’s shown. In their camp, they have a friendly little visitor. 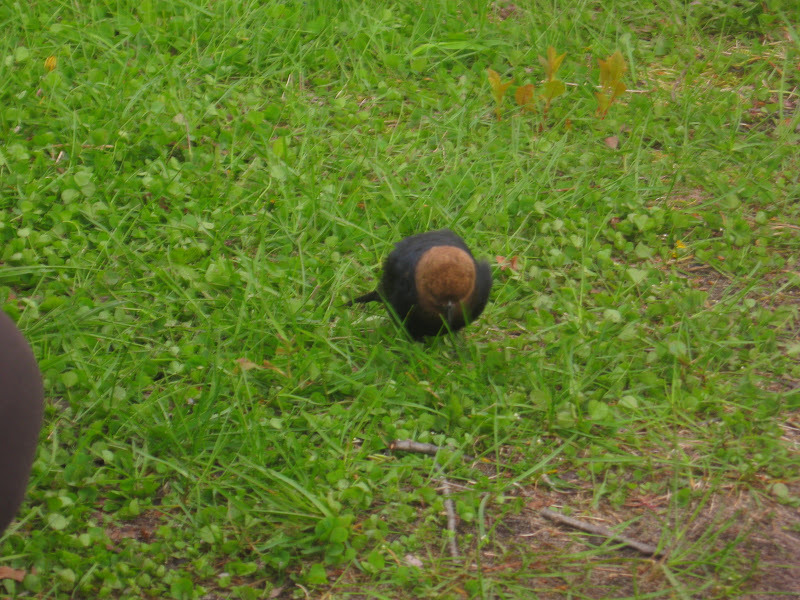 This brown headed cowbird keeps wandering through camp, not paying any attention to us at all. 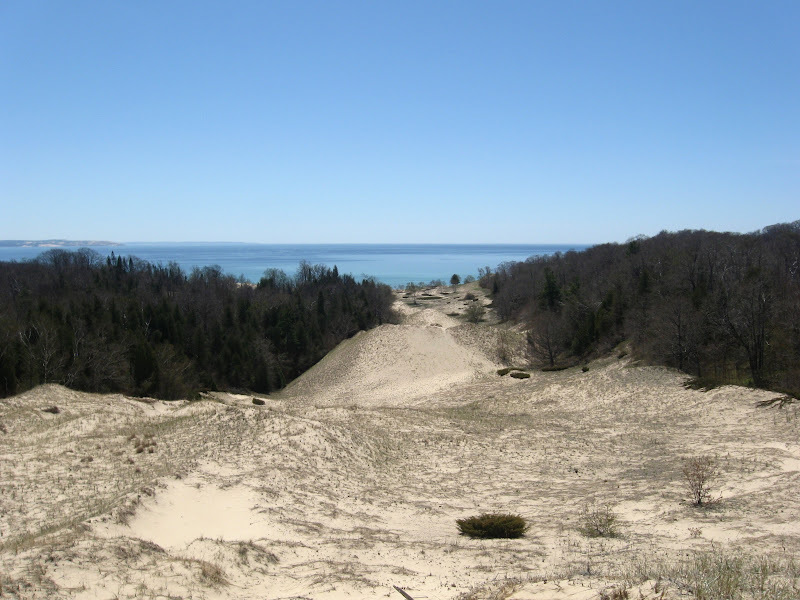 As many times as I’ve been to North Manitou Island, I’ve never really explored the Crescent City area. Just south of their campsite there is quite a large pond. I think I’ll spend tomorrow exploring around it more. It will be getting dark soon, so I set up camp across the field. It’s too close to the main trail, but there are few people on the island right now, so it will be okay. It’s a beautiful morning, and I wake to the sounds of all the wildlife down at the pond across the field. I’ll stay another night here, and just spend today day-hiking around the area. I deploy my solar panels in the field to charge my batteries, make a brief stop at Keith and Cindy’s camp, and then head down to check out the pond. 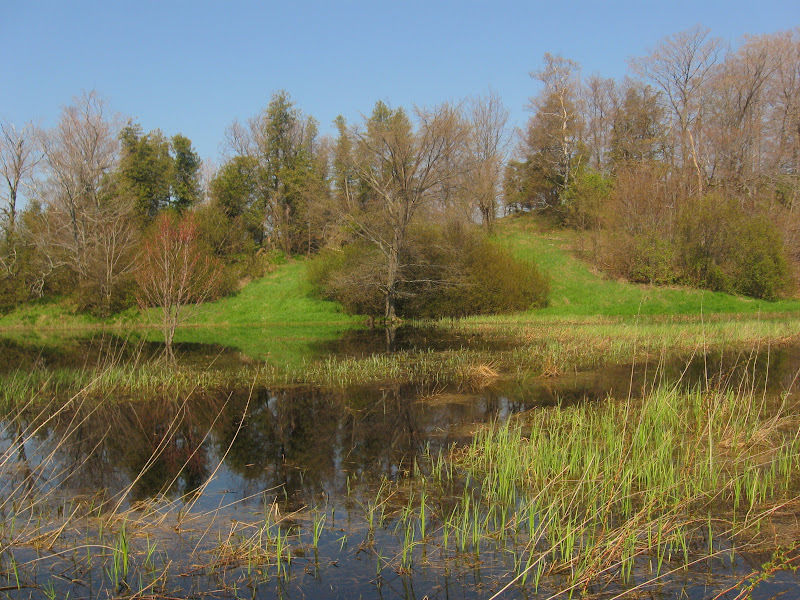 The lush green grasses, the red buds coming out on the trees and the cloudless blue sky all reflect off the mirror like surface of the pond. This green hillside to the northwest looks like something out of a Hobbit movie. 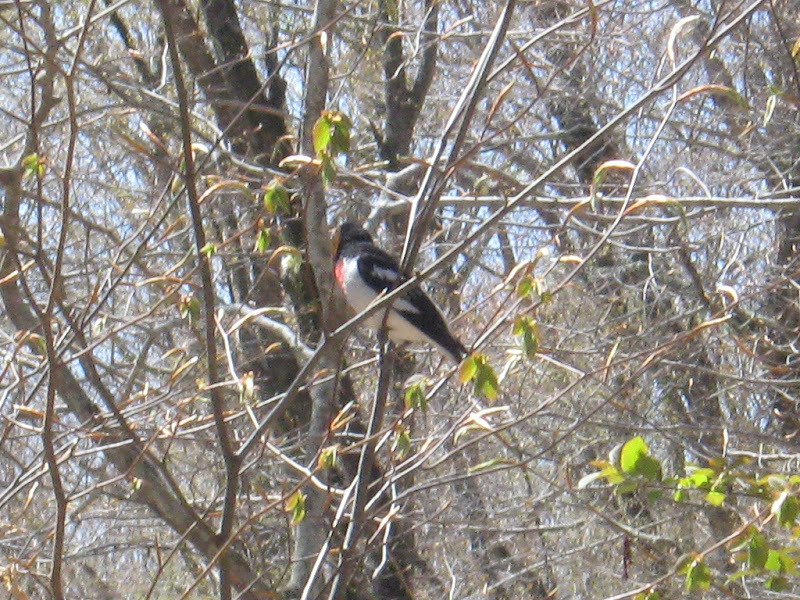 This colorful red-winged blackbird is one of the many visitors to the pond. On the east side of the pond is a wet area with flowing water, but I couldn’t pinpoint any single source. I don’t know if it would be classified as a spring. 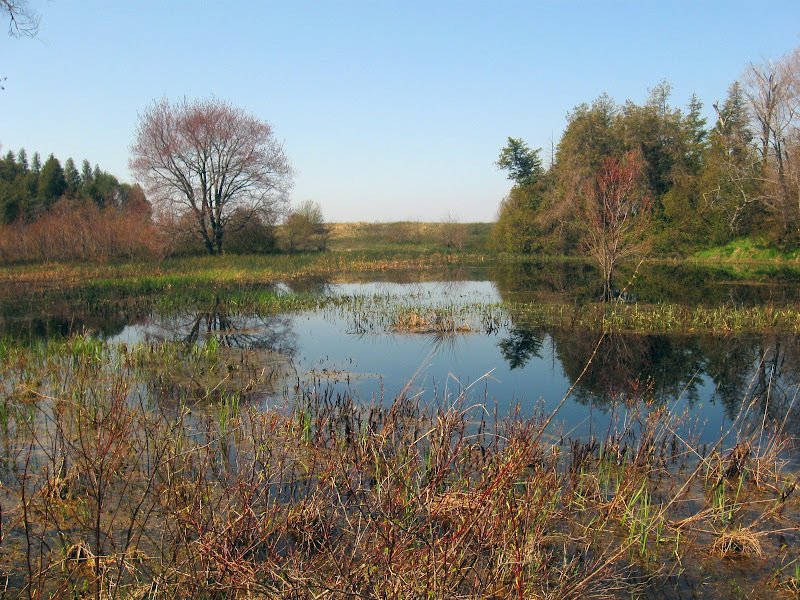 I’ve spent the last couple hours walking around the pond and surrounding wetland. It’s quite scenic. It’s hard to imagine now what this all looked like a hundred years ago, when this was a boom town for the lumbering industry, complete with a post office, schoolhouse, hotel, and even a saloon. Throughout the afternoon, the weather has kept changing, going from clear, warm, and sunny, to cold and foggy, and back again. But it didn’t rain. Overall, it’s been a very pleasant and relaxing day. Keith stopped by to check out my hammock setup, and invited me back for more desserts. The sun is now setting, and its golden rays color the trees across the field. The greens, golds, and blues look like a painting. I pick up my solar panels on the way, and turn in for the night. Tomorrow, I’ll head back to the other side of the island, and find Angell Spring. Keith and Cindy gave me a good idea where to look. Keith and Cindy stopped by my camp this morning, on their way back to the east side. They’d like to know, after I find Angell Spring’s exact location, how close their guestimate was. 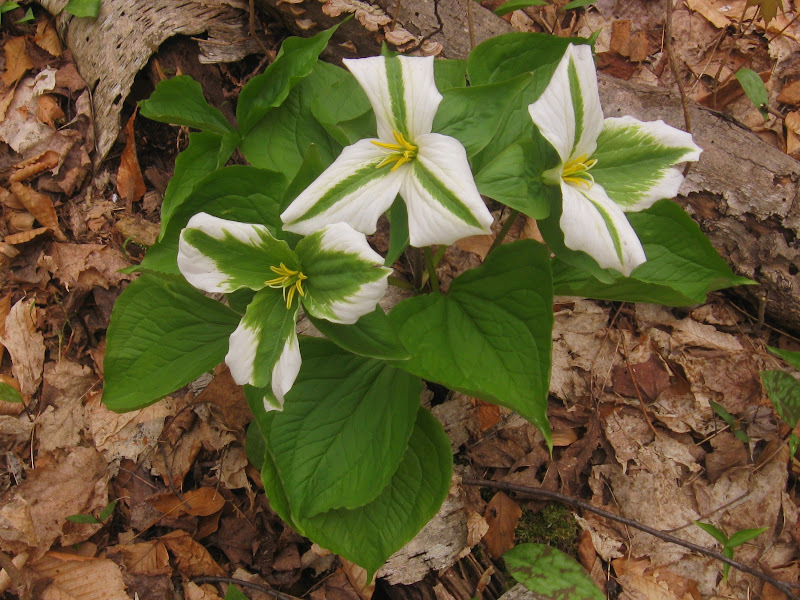 Along the centerline trail, I find these unusual green and white trilliums. Unfortunately, the green is a virus which will eventually kill the plant. Wandering around the area Cindy and Keith mentioned, I start to find areas of wet ground, and searching south toward the pine trees, I finally find Angell Spring! I would not have done it without their help. 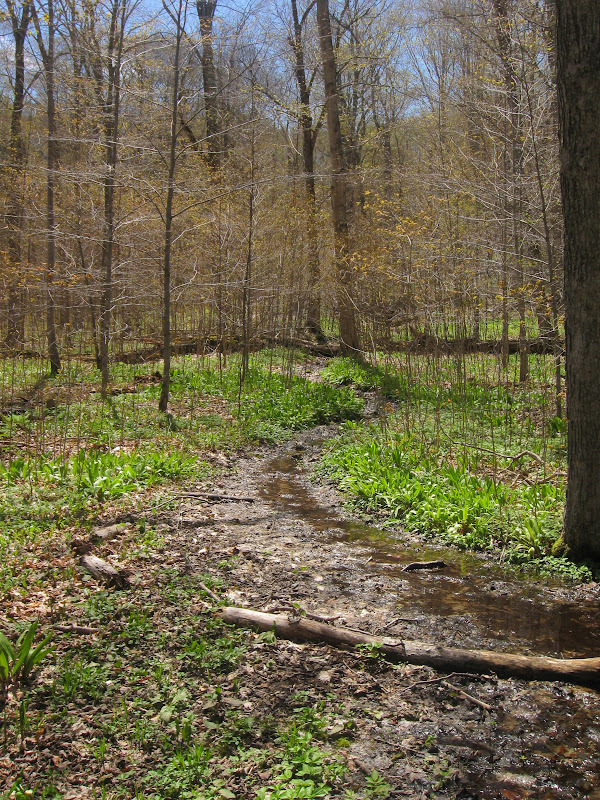 The terrain around the spring is mostly flat, allowing for pretty easy access to it, although it is also very soft and wet. My water ran out this morning, and I hiked here dry. While my pack refills, I listen to the sounds of nature, and watch some birds come to drink. 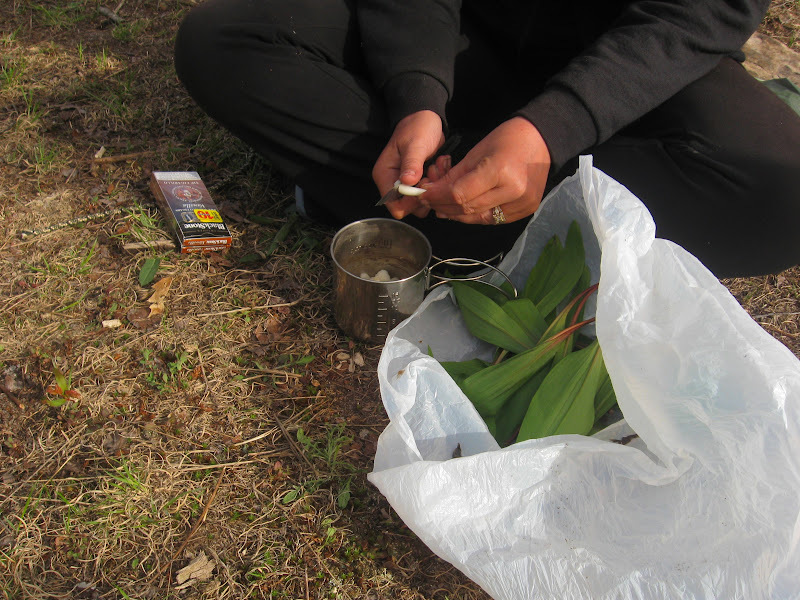 Along the sides of the stream are many wild leeks, so I’ll gather some to take to dinner. The day is getting on, and my friends are expecting me for dinner. 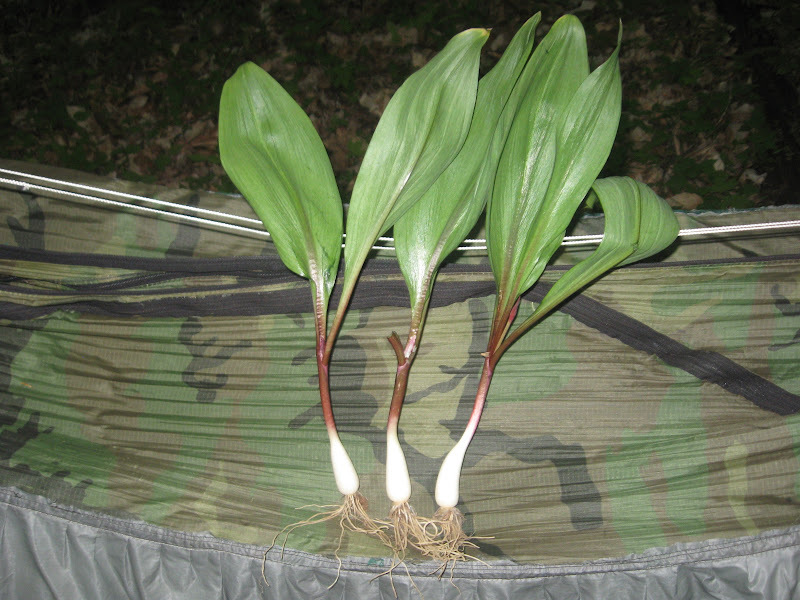 I gather some leeks, and after another couple miles, I’ve found their eastern camp. They share another hot meal with me, and we all enjoy some delicious leek soup. Where they had pointed the spring out to me on the map was within a hundred yards, very close! Before it gets dark, I set up my hammock. The forecast says zero percent chance of rain, so I’m not putting up my tarp. Tomorrow, I’ll head down to Old Baldy for the meteor storm. Ah, another perfect morning. I’m accompanying Keith and Cindy back to the dock, and will return to break camp on my way down to Old Baldy. This is the Friday before Memorial Day, the beginning of the holiday weekend, and the island usually gets a lot of visitors. It wouldn’t surprise me if others have the same idea about watching the meteor storm from Old Baldy, so I want to get there first. The hike to the dock and back doesn’t take long. I’ve got almost ten pounds of water, my 3L that I filtered at the spring, plus my 2L dirty bag that I also filled, but haven’t filtered yet. There won’t be any source of water where I’m camping tonight. My pack weighs about 50 pounds, but it doesn’t seem too bad. The old external frame carries the weight well. Just past the intersection to the cemetery, I reach the road to Stormer Place. 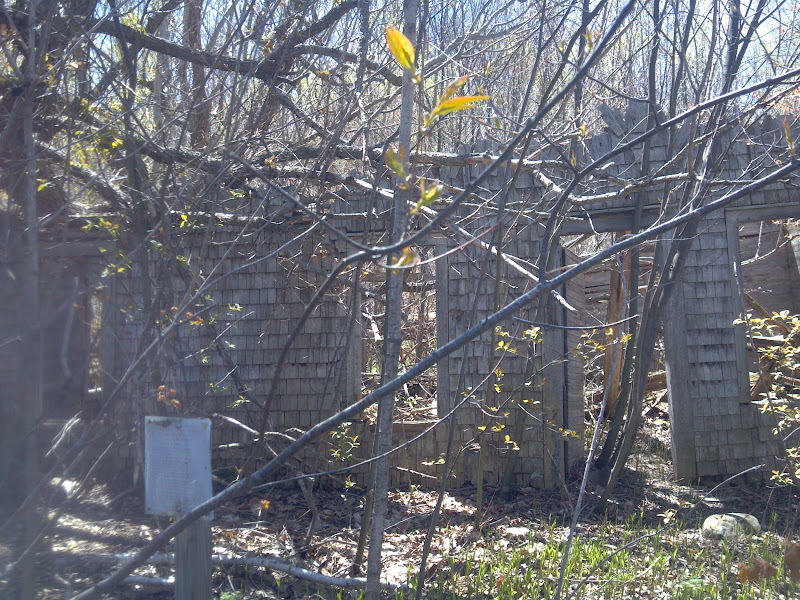 Hidden along the southern edge of the clearing is the old house. Many smaller trees have started growing around it, and now it would be difficult to spot by chance. 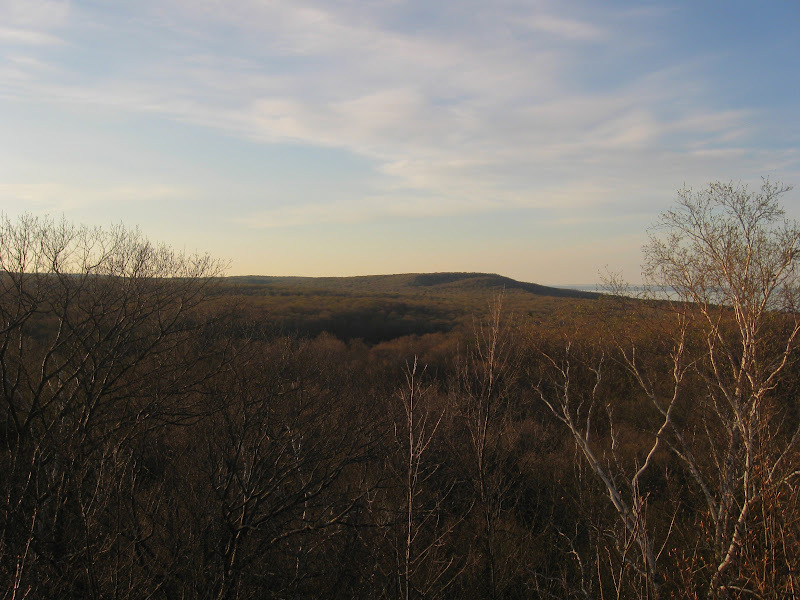 Behind the house, there are a couple tall ridges and deep valleys to traverse to get to Old Baldy. I’m taking a shortcut up the side of the dune. Yes, I could have followed the main trail all the way to the western beach, south, and then the mile long hike up the dune, but that would have added a couple hours to my trip, and I wanted to get there before anyone else. 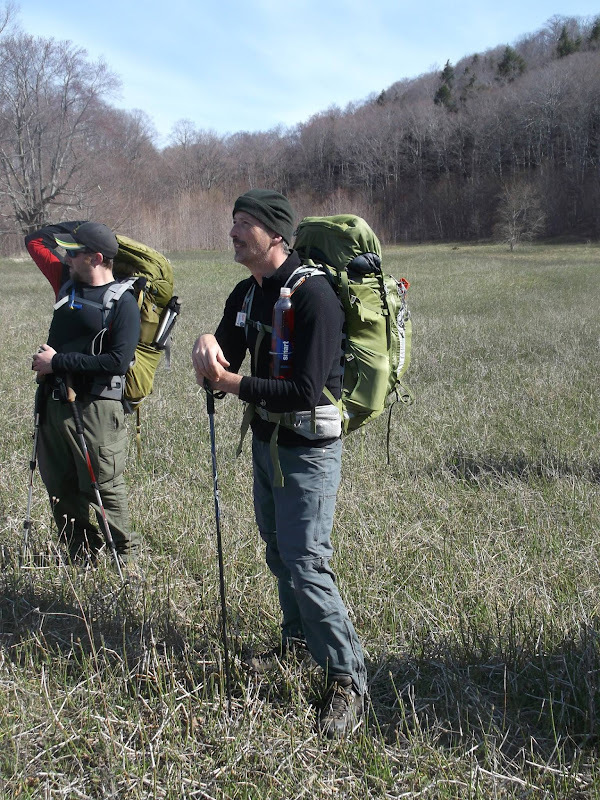 It’s difficult making the vertical ascent, and the downs are a bit dangerous, especially with a full pack plus the additional five liters of water. Eventually I reach the last ridge, with steep drop-offs on either side, and along the ridge itself, many small trees and even a few briars are growing up, through, and around all the fallen larger trees. In a couple spots, I have to crawl under. At last, I break through, and only a small valley of sand separates me from my destination. This is the earliest in the year I’ve ever been up here, and it looks so much more open. I can clearly see the dock to the north, four miles away. To the southeast, the water’s edge is about a mile away, but you can’t see it from here because of the false summits. There’s nobody here yet, and I’ve still got half the day before me. There’s no natural shade up here, so I have to make my own. 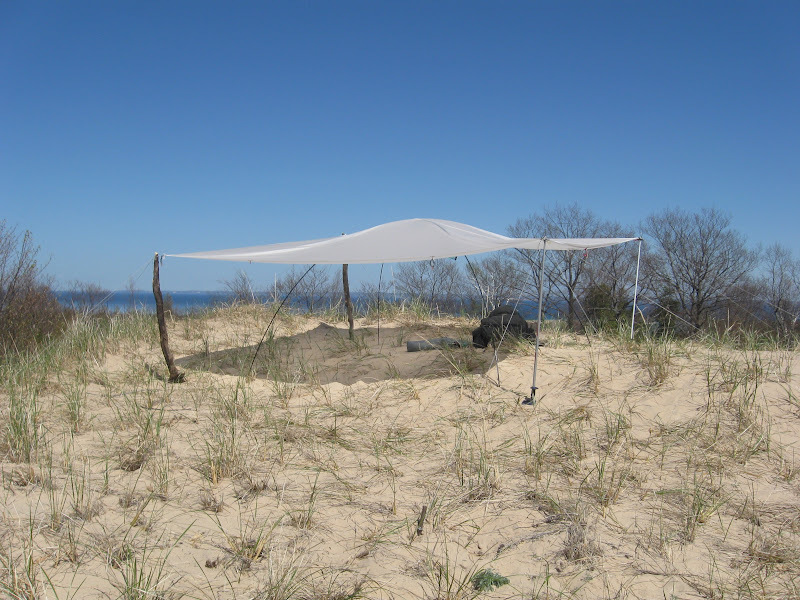 With a little backcountry engineering, my tarp becomes a nice 10’x12’ sunshade. 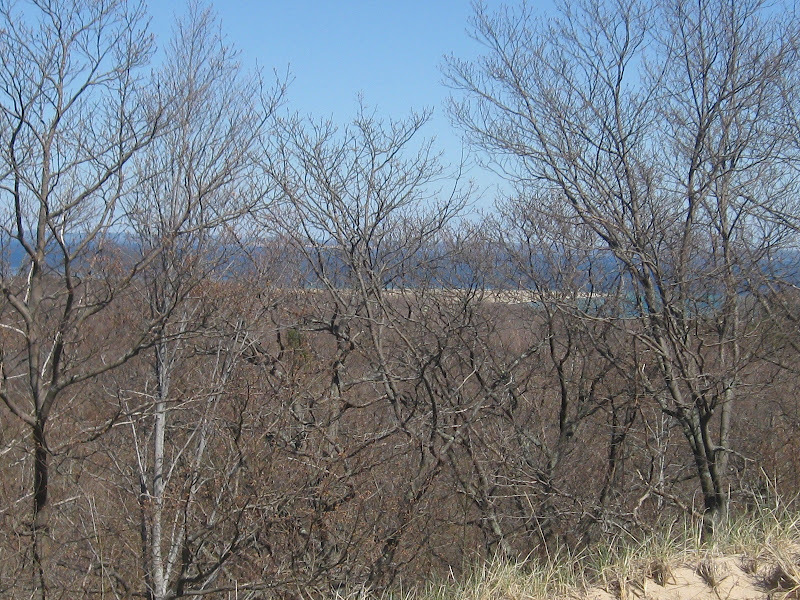 To the east, I can see Dimmick’s Point through the trees. Dimmick’s Point is closed off due to the endangered Piping Plovers. About thirty yards from the peak, I find a spot to hang my hammock. The height of the storm should be sometime between 2 and 4 AM. The moon won’t rise until almost dawn. There is zero percent chance of rain, and no leaves on the trees my hammock is tied to. We have maximum visibility. It doesn’t get any better than this! As the evening sun sets in the west, the hills to the north are bathed in a soft golden glow. 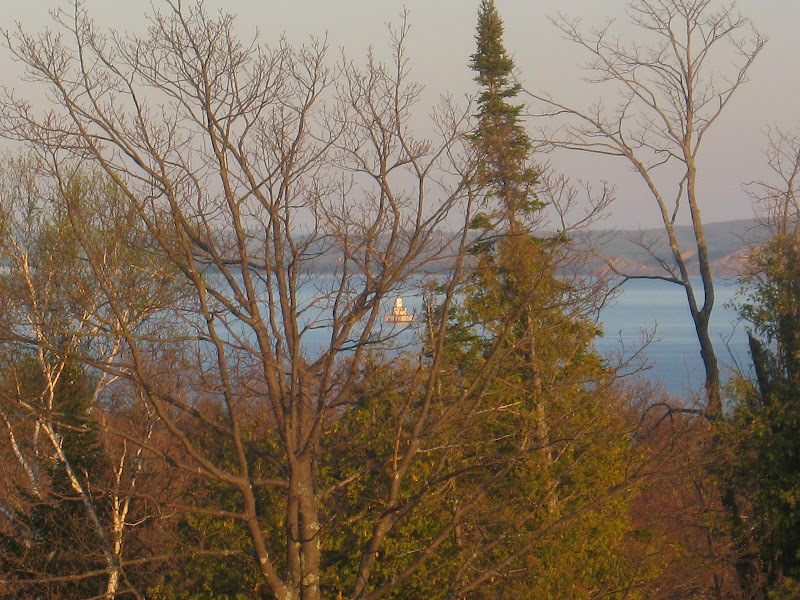 To the south, through the trees, I can see the last rays of light glistening off the lighthouse. 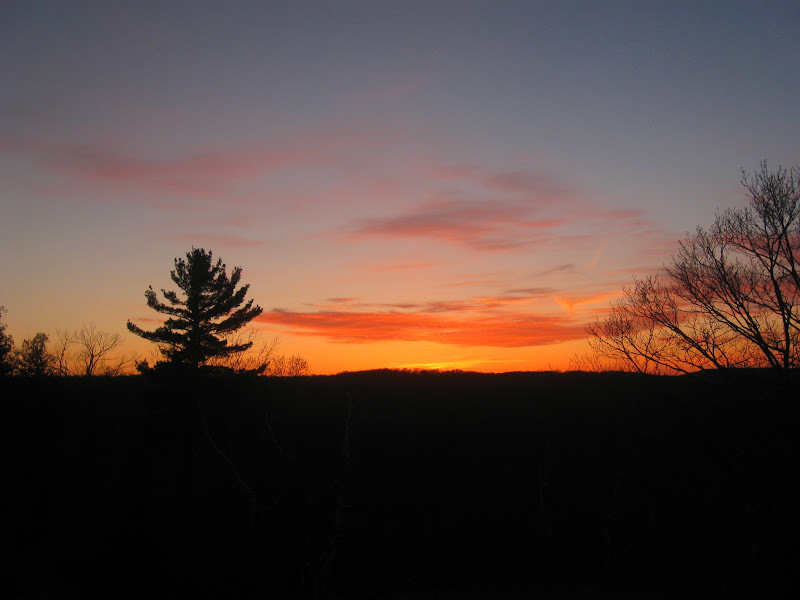 The sun finally disappears behind the island, setting the sky afire. Sadly, the meteor storm never happened. I woke up throughout the night, thanks to my alarms, but saw little more than a beautiful starry night. I only saw a couple shooting stars, and they were few and far between. In case it had turned out big, my camera was ready, and I would have lain on the very peak, but that fate was not written in the stars. Still, being able to spend any cloudless night on a hilltop with such a view is worth the journey. I guess my rush to get here before anyone else was unnecessary. Nobody else ever showed up. I’m glad. I enjoyed the solitude. The sun rises early when you’re on the top of the island, so I’m setting out my solar panels to charge my batteries. Also, my 3L reservoir is almost empty, so I’m filtering the extra 2L I brought up here. I’m spending a couple hours just enjoying the breeze. It’s past mid day now, and time I should be moving on. In my wanderings, I’ve spotted a few more roads, and want to try to map them out. My next campsite will be near Angell Spring. 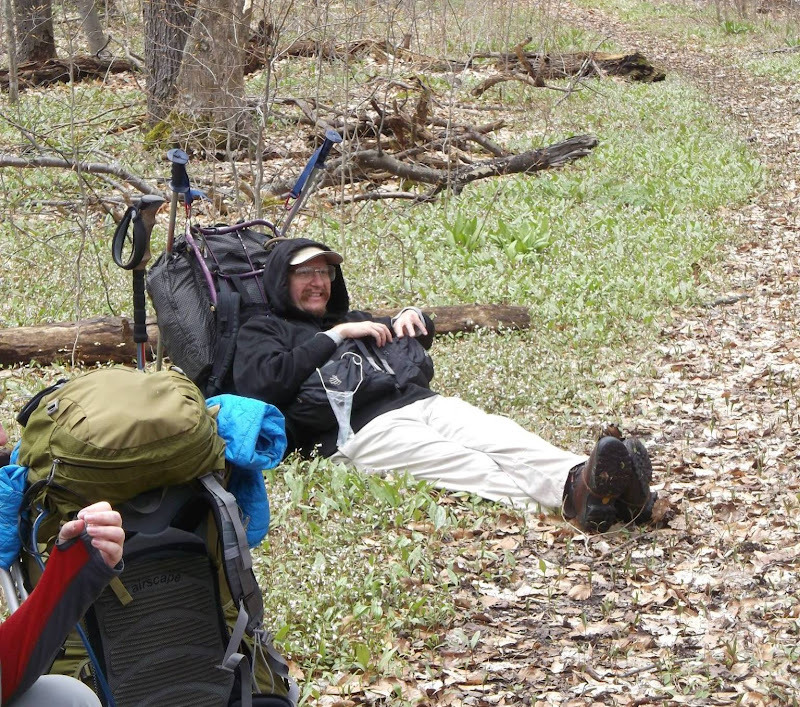 I pack up, and this time head down the north face of Old Baldy. It’s just about the steepest way, but also the clearest, being sandier than the other options, with fewer trees, and less deadfall. I’m down in the valley now, on the forest floor, and the map shows a road going through here somewhere. I’ve spent a couple hours now wandering around to and fro, but if there ever was a road, I can’t make it out. I give up for now. It’s time to head for Angell Spring. Further east, I finally found a road. I’ve probably been following it for a while, and didn’t know it. I’d like to stay and go back over it now, but it’s getting late, my pack is heavy, and I don’t think I’ll have enough water for tomorrow, so I need to get back to the spring tonight. I’ve still got six days left, so I’ll be back. I continue following the road east, through two old homesteads. One of them has a lot of strange, small trees, with fuzzy branches. They kind of remind me of reindeer. I wonder what they are. Eventually I reach the cemetery clearing. From there, I take the main trail north until it tees and then keep going north (this part is hidden). It’s only been a few days since I was last on this road, and everything is really changing quickly. 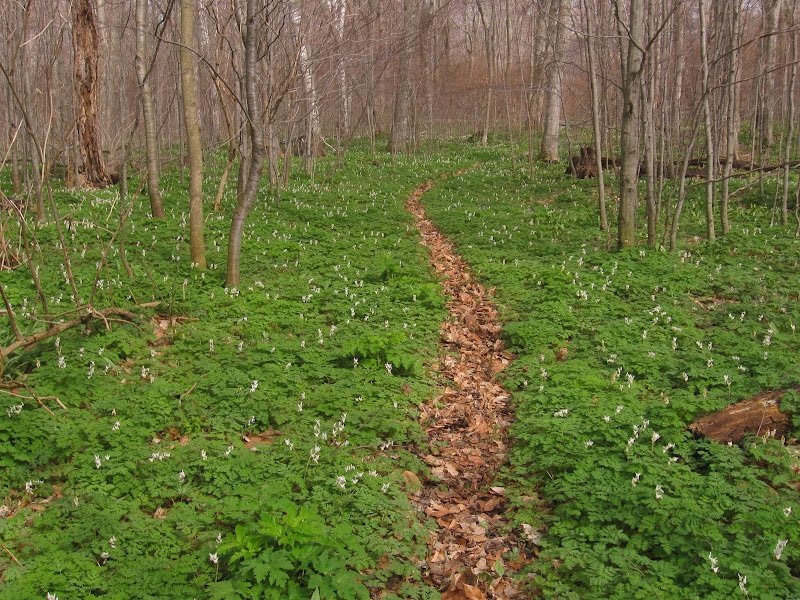 The forest is coming to life, and the trilliums are out in force. I’m finally back to Angell Spring. Just up the hill from it, there appears to possibly be a road. That’s where I’m setting up camp, so I can explorer this area more tomorrow. The forecast is very clear, so I’m not putting up my tarp. I really love sleeping out in the open, without nothing to obstruct my view. 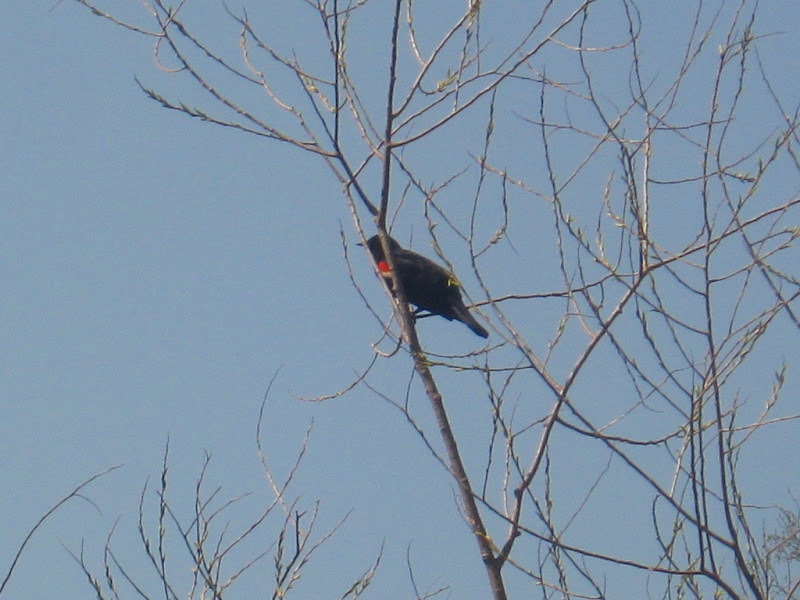 I wake to blue skies, green leaves, and the singing of songbirds. This seems like the most perfect of days. Today, I’m just going to day hike around, no heavy pack, just some snacks and water and camera and such. The “road” I’m camped next to, if it ever was one, disappears shortly in either direction. For now, I’m not going to include it on any maps. But there are other old roads to explore. 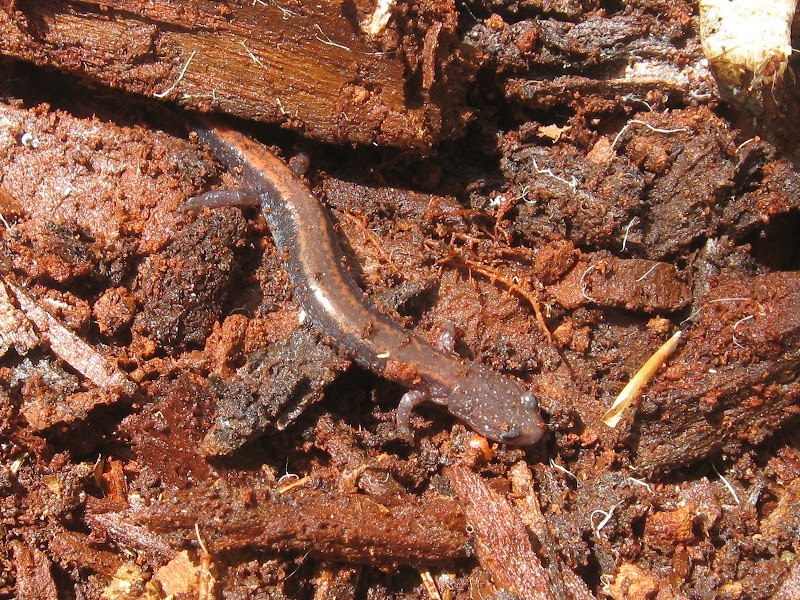 I’ve come across a couple of these red salamanders today. I peeled some bark off a fallen log I was sitting on, and there it was. 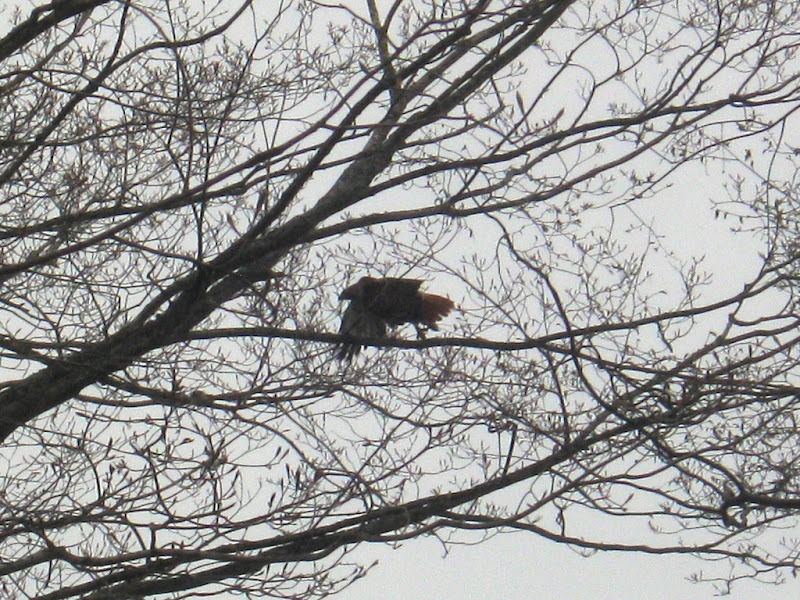 But I wasn’t quick enough with my camera that time. 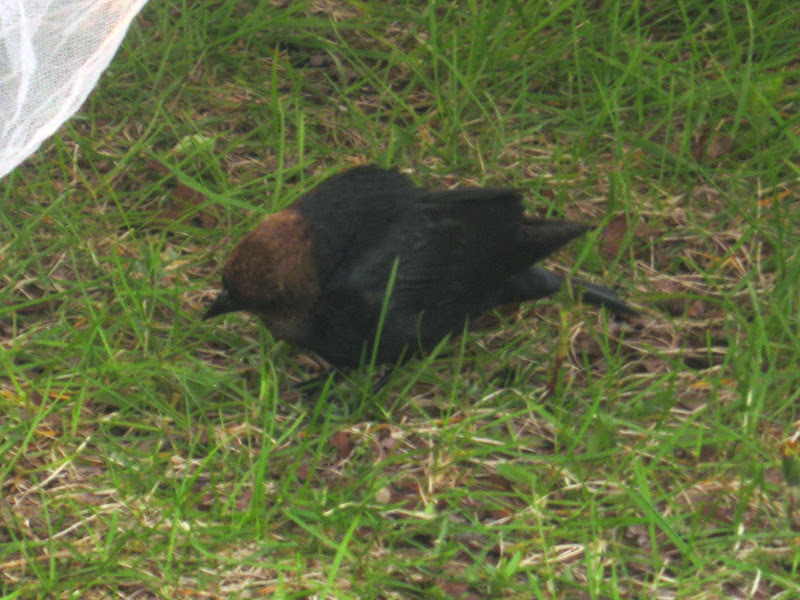 This one was underneath a log I rolled out of the way. I’ve never seen these on Manitou before today, and now I’ve seen four. One of the old roads I’m following goes towards the center of the island, up a ravine, and then becomes indiscernible. 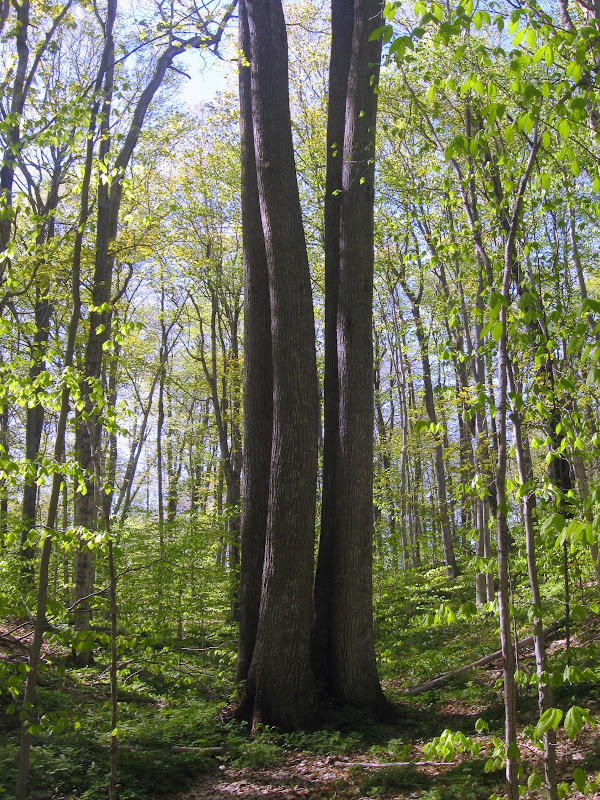 But nearby, I spot this unusual clumping of four tall trees. It’s early evening now, and I’m back at camp. I made a little shelf on this tree for the convenience of putting my contacts in and out, shaving, etc. And beneath the shelf, I hung my hat inside out and lined it with a bag to make a basin for washing and shaving. I enjoy having most of the comforts of home while I’m living out in the woods. Around 4:00 this morning, the wind started to blow through the treetops far above, though it was but a gentle breeze down here on the forest floor. In that wee hour, before the sun had yet risen above the horizon, its first rays colored the eastern sky red, foreboding the coming rain. So I put up my tarp, and went back to bed. Now it’s around 9:00, and the rain is starting to fall, but I’m protected and dry. I enjoy the pitter patter of falling raindrops on my tarp, and it lulls me back to sleep. Today is the end of the holiday weekend, and I expect that most of the campers will be leaving. Now that I think about it, that means they had to pack up their stuff wet, or had already done so and are now waiting in the rain for the boat. But I still have four more days here, and from the forecast, it looks like they will be beautiful ones. I’ve decided today will be a zero day for me, a day without hiking, just staying close to camp and relaxing. I haven’t had such a day yet this trip. Now fully rested, I’m going to spend the day exploring the roads between the cemetery and Old Baldy, the ones I came down on Saturday, but couldn’t make out until I was half way down them. The weather is pleasant, overcast but dry. I’ll also set out my solar panels to recharge my batteries. 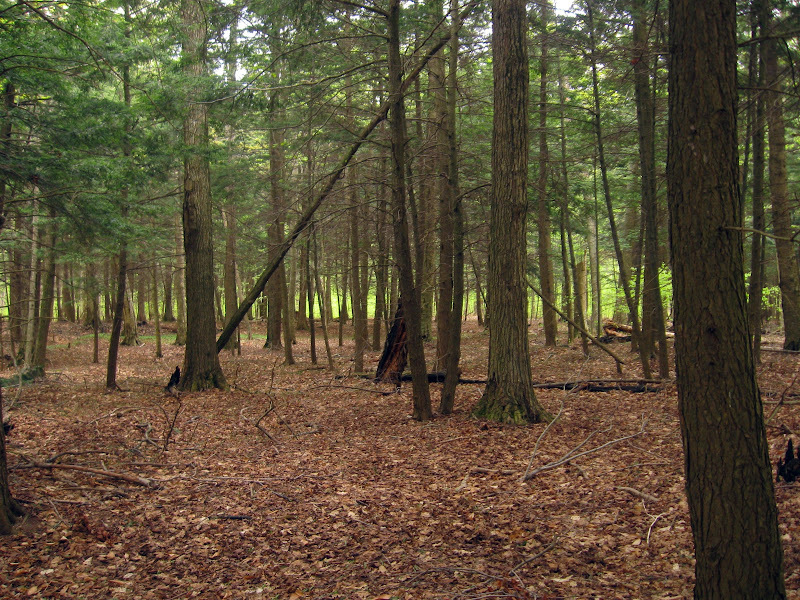 My camp is just up the hill from Angell Spring, but a few hundred feet south, and right on the trail, is a much nicer and more convenient stand of evergreens that would make a better campsite. This trail is a secondary one. It’s on the map, but gets few travelers, so I wouldn’t hesitate to camp here. It’s also spacious enough for a larger group. I make my way down to the cemetery, and deploy my panels in the western corner, close to where my road re-enters the woods. I don’t know how many people are left on the island, but I doubt anyone would find my solar panels here. The road to the west is easy to follow at first, but eventually becomes so overgrown as to be of little use. But there are more roads I found along the way, which I didn’t have time to explore today. It’s getting late, and I’m on my way back. 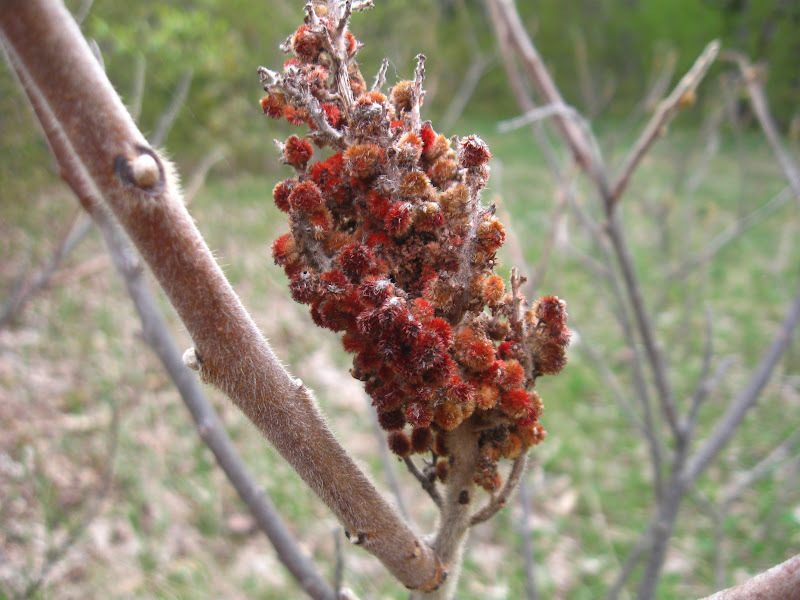 Those fuzzy branches in one of the clearings now have berries on them, and I believe they are staghorn sumac. I’ll be returning to the island in the summer, and think I would like to try making some sumac-ade. It’s supposed to be delicious. I moved more quickly on my return trip, now having a known road to follow, but I spent many hours exploring the hills and valleys to the west, and didn’t get back to camp until after sunset. Day by day, the green leaves are growing thicker over the hidden roads, and in the failing light, even the familiar paths become difficult to follow. But then you see a familiar log or stump, and are reassured you’re still going the right way. Much like Monday, today I spent doing not much more than relaxing, and hanging out around camp. As the date of my departure from bliss approaches, I start thinking about pizza and cheeseburgers. But it’s not that I’m craving them. If I wasn’t leaving soon, I probably wouldn’t be thinking of them at all. I could happily stay here another week or more. In fact, I almost dread the thought of rejoining civilization. I physically feel better after I’ve been here a while. I’m eating healthier foods, getting some exercise and fresh air, going to bed when it gets dark, and waking to birds singing. It’s just good for you. But, all good things must come to an end. Tomorrow I’ll pack up, and move close to the dock so I don’t have to get up too early Friday morning. Today is moving day, my last full day on the island. This spot by Angell Spring has been my home for five days now, and I have little desire to leave. There is a zero percent chance of rain for the next couple days, and it looks like a beautiful weekend. But, I have lots of work to do on the photos I’ve taken and the maps I’ve been making, so it’s time to start getting back. 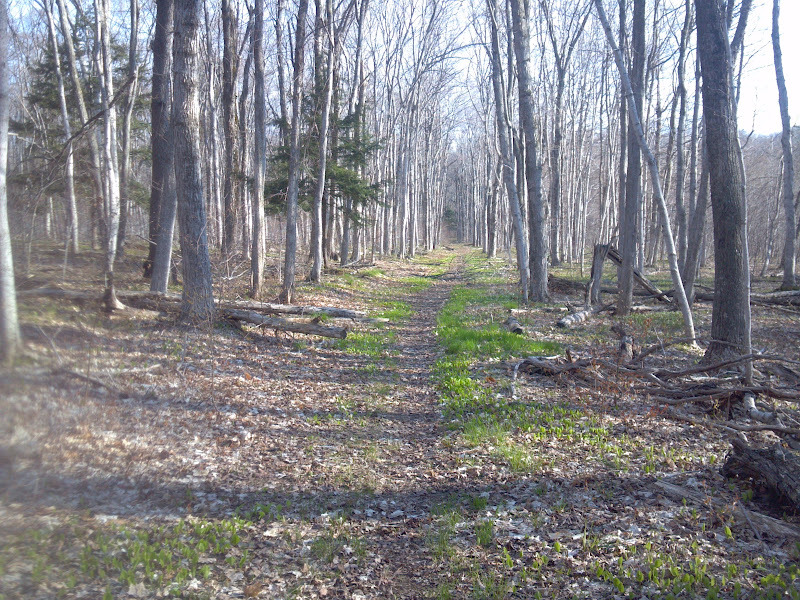 The same trails we walked almost two weeks ago, which were so bare and open, are now green lit tunnels. So much has changed in the last few days, and I feel truly blessed to have been able to watch it unfold day by day. 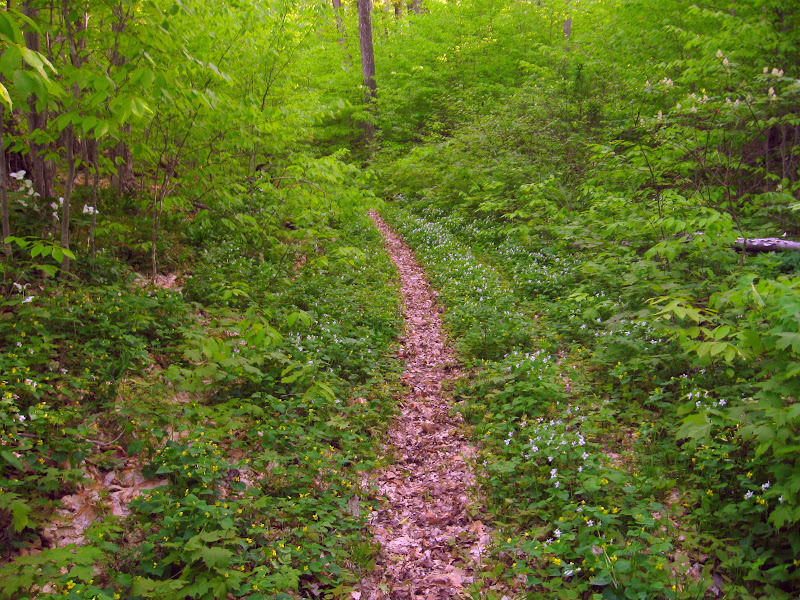 The wide trails have become harrow footpaths, lined with colorful wildflowers. My final camp is just outside the village boundaries, up on a ridge, maybe a half mile from the dock. Along the way, I pick a few more leeks to eat tonight. I’ve probably had a dozen this week, and they’re delicious. No cooking required, just brush the dirt off and start eating! I pack up and head for the dock, crossing the old airfield. To my surprise, there’s nobody else waiting to leave, so I wander to the dock to await the boat. 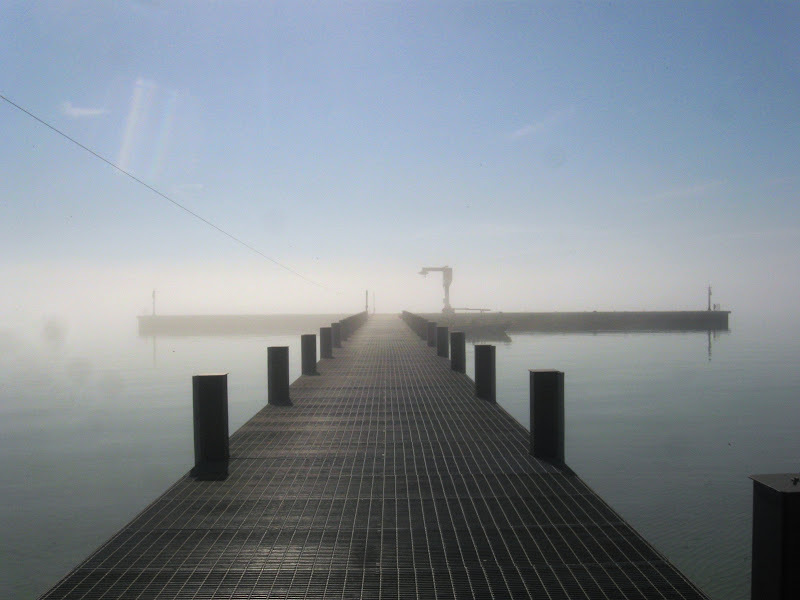 Fog covers Lake Michigan. I’m not alone! On the dock, I meet Aldo. A ranger told him he was the only person on the island. Apparently they didn’t even know I was here! 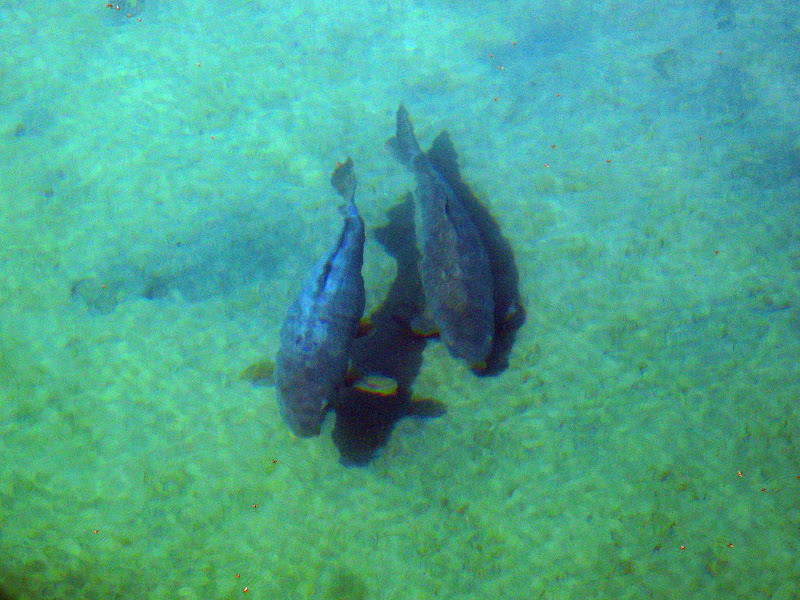 As we wait for the boat, a couple of carp swim near the dock. The Mishe-Mokwa picks up Aldo and me. 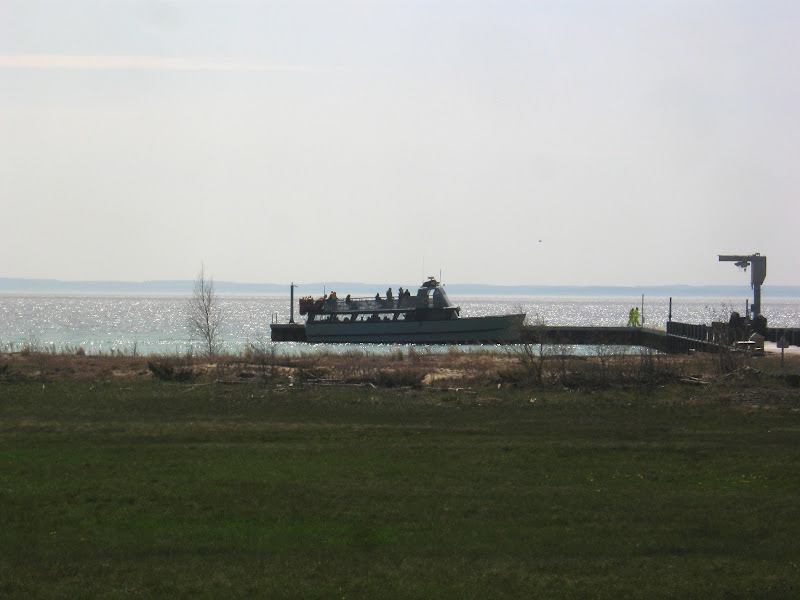 There are a few other people on board, heading for South Manitou Island. The tugboat Ann-Marie is there as they build the new dock. 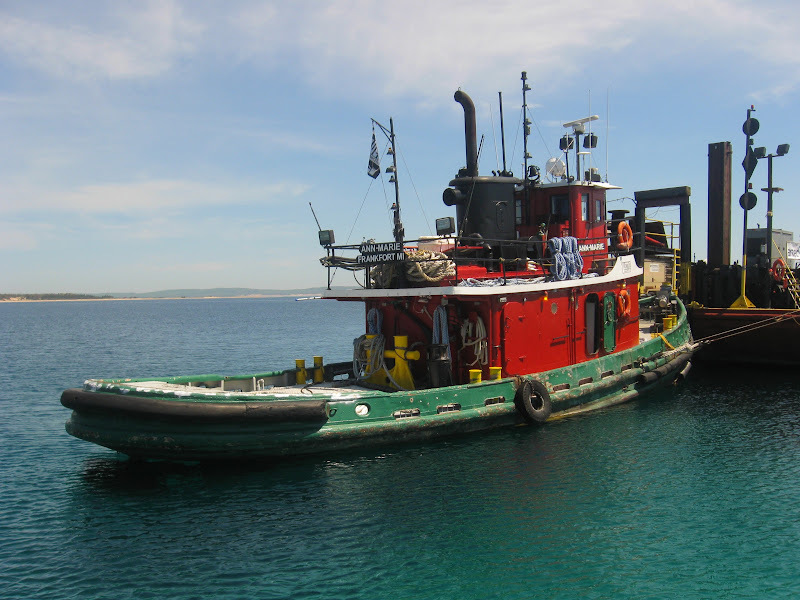 After just a few minutes, we depart South Manitou Island. Lake Michigan is clear and calm as we make our way back to Leland. 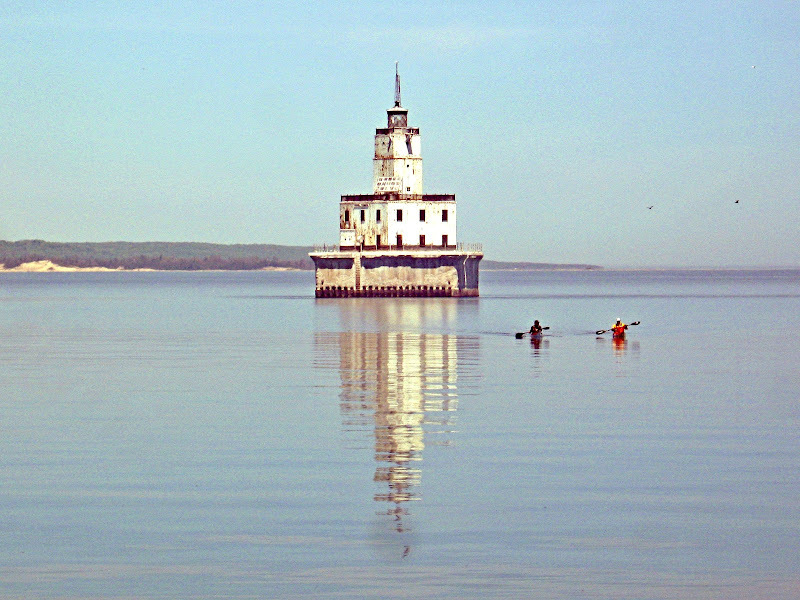 In fact, it’s so calm, that as we pass the lighthouse, we see a couple of kayakers. This was a wonderful vacation, and I can’t wait to do it again next May! Last edited by 3club; 06-27-2014 at 20:57.